Abstract: Lasers can exhibit various kinds of "noise", with manifold influences on applications. Here we discuss where such noise can come from, how it is quantified and how its influences can be minimized. “Noise” of lasers is a short term for random fluctuations of various output parameters. This is a frequently encountered phenomenon which has a profound impact on many applications in photonics, particularly in the area of precision measurements. Consider e.g. interferometric position measurements, which can be directly affected by fluctuations of the optical phase, or spectroscopic measurements of transmission, where intensity fluctuations limit the possible sensitivity. Similarly, the data rate and the transmission distance for fiber-optic links are at least partly limited by noise issues. Many engineers and physicists feel more or less uneasy about laser noise. One reason is that the causes are often hard to evaluate and eliminate. Further technical and mathematical difficulties are related to measuring and quantifying noise; specifications found in many data sheets reveal less about the laser than about the competence of the person who made the specification. Furthermore, it is desirable but not always easy to estimate the influence of different kinds of noise in some application. For such reasons, trial & error approaches without a decent understanding are often used e.g. for minimizing noise influences, but this often turns out to be ineffective or inefficient. This series of articles is intended to explain some basics and thus to help finding rational solutions. Part 1 treats intensity and phase noise; many aspects, of course, can be applied to other types of noise. Later articles will deal with fluctuations of pulsed lasers and with beam pointing fluctuations. Intensity noise is usually understood to quantify fluctuations of the laser output power (not actually an optical intensity), and in most cases normalized to the average power. The measurement is based on recording the temporally varying output power, using a photodiode, for example. The normalization is the simplest aspect; other aspects, to be discussed in the following, are more subtle. where Pav is the average power. This is usually applied to relative power fluctuations, thus specifying relative intensity noise (RIN). The r.m.s. RIN is of course dimensionless. Another problem is that the registered fluctuations can strongly depend on the measurement bandwidth. 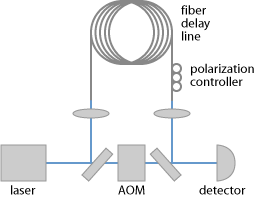 For example, a laser may exhibit fast fluctuations of the output power, which are seen by a fast photodetector, while being averaged out and thus not registered by a slower detector. Furthermore, a limited measurement time may not be sufficient to detect slow fluctuations (drifts); essentially, one does not know how far the average power in the chosen time interval deviates from the average over longer times. For these reasons, a simple number without specification of a measurement bandwidth (lower and upper noise frequency) is actually meaningless and should never occur in a data sheet. The measurement bandwidth may extend from some very small frequency, limited by the inverse measurement time, to some maximum frequency, determined by the speed of the detector. Note also that any noise specification is actually a statistical measure, which is only estimated by one data trace for a given time interval, or (better) with an average over several traces. Further, the laser noise may depend on ambient conditions. Therefore, one should know whether a specification applies for constant room temperature, after a long warm-up time, and in a vibration-free environment. If it is of interest to which extent different noise frequencies contribute to the overall noise, a power spectral density (PSD) SI(f) is most useful. Conceptually, one can imagine that many noise measurements are done for different (small) noise frequency intervals. This is how many electronic spectrum analyzers record noise spectra: the detector is subsequently tuned to different noise frequencies. However, there are also techniques based on Fourier transforms, which allow to estimate whole noise spectra from single (or a few) data traces recorded in the time domain. One may e.g. use a sampling card to record a signal proportional to the laser power over a certain time and with a certain temporal resolution. Before doing a Fourier transform, a so-called “window function” must normally be applied to avoid certain artifacts. The lowest noise frequency in such a measurement is the inverse total duration, while the maximum frequency is at most half the sampling rate. The latter limit results from the Nyquist theorem. 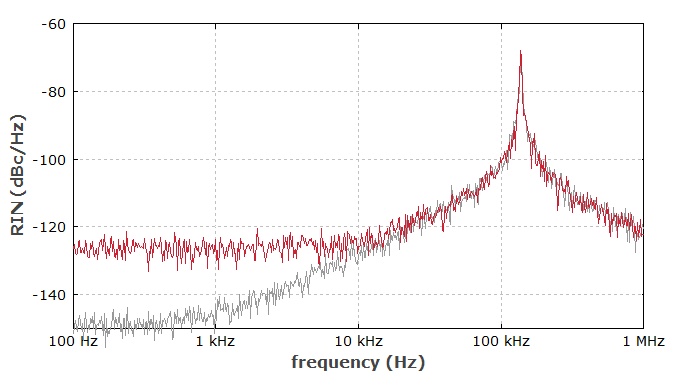 where f1 and f2 are the lower and upper noise frequency, respectively. (This is assuming a one-sided PSD; physicists often use two-sided PSDs, where the integration also has to include negative frequencies.) The units of SI(f) are 1/Hz, indicating that SI(f) is the noise contribution per frequency interval. It is also common to specify 10 · lg(SI(f)), arriving at units of dBc/Hz, meaning dB relative to the carrier in a 1-Hz noise bandwidth. Figure 1: Simulated intensity noise spectrum of a diode-pumped miniature Nd:YAG laser. Gray curve: with quantum-limited pump source. Red curve: with 30 dB excess noise of the pump source. Fig. 1 shows the simulated relative intensity noise spectrum (i.e., SI(f) versus frequency) of a diode-pumped single-frequency Nd:YAG laser, using logarithmic scales for both axes. The RIN exhibits a characteristic peak around 140 kHz, related to so-called relaxation oscillations, which result from the dynamic interaction of the intracavity power and the laser gain. Obviously, a detector with 20 kHz bandwidth would not be able to detect such fast oscillations and would thus record much weaker noise than a 200-kHz detector. Laser diodes exhibit relaxation oscillations with much higher frequencies (multiple GHz) and stronger damping due to their short carrier lifetime and short resonator. Generally, different laser types can exhibit very different noise properties, as characteristic parameters may be totally different. Around the relaxation oscillation frequency fro, a laser is particularly sensitive to external noise influences, e.g. from the pump diode, and even to quantum noise. Well above fro, noise of any kind has little impact. Well below fro, pump noise may directly affect the output. For the red curve in Fig. 1, some frequency-independent excess noise of the pump diode has been assumed; in reality, there can be an increase toward lower frequencies, often determined by the quality of the diode driver. Even for a perfect shot-noise-limited pump source (gray curve), noise around fro is relatively strong. The impact of quantum noise depends on various parameters; in particular, it is stronger in cases with low intracavity power, high resonator losses and a short round-trip time of the resonator. Additional contributions to intensity noise of a laser can result from acoustic influences. For example, a cooling system may cause vibrations of the laser resonator, which translate into intensity and phase noise. In many cases, such noise contributions appear in the form of sharp peaks in the spectrum. An entirely different phenomenon is noise from mode beating in lasers where multiple resonator modes are oscillating. The occurring beat frequencies are differences of resonator mode frequencies, which may be rather high (multiple GHz) for laser diodes and very low (few kHz) for long fiber lasers. The pattern of beat frequencies can reveal whether or not the laser operates on axial modes only. A first approach is the minimization of external noise influences, e.g. by using singly-frequency pump diodes operated with a carefully stabilized current source, and making a mechanical stable laser setup. A second possibility is the optimization of laser parameters such that the impact of quantum noise and/or external noise influences is minimized. For example, one may minimize quantum noise influences by using a long low-loss laser resonator, or move the relaxation oscillation frequency into a region where noise is less strongly disturbing the application. Finally, one may reduce laser noise with a feedback system, automatically adjusting e.g. the pump power based on measured output power fluctuations. The characteristics of the feedback loop need to be optimized based on the knowledge of laser parameters. Obviously, the potential of these approaches depends very much on the circumstances, which should thus be analyzed carefully beforehand. Without a proper understanding of the sources and types of noise, such exercises are prone to fail or at least to be inefficient. The intensity noise of nearly all light sources is limited by shot noise. In an intuitive (and somewhat simplified) picture, this can be understood as the random occurrence of photons (packets of light energy). Even if the probability of detecting a photon within some short time interval is constant, the actually recorded photon absorption events exhibit some randomness if there are no correlations between photons. This leads to a PSD of the relative intensity noise of 2 hν / Pav, where hν is the photon energy. The relative intensity noise of a laser is often well above the shot noise level, but the latter rises if the output is more and more attenuated (e.g. with some linear absorber). With sufficiently stronger power attenuation, the intensity noise will be at the shot noise limit. Squeezed states of light can exhibit intensity noise below the shot noise limit, but require special methods to be generated, and tend to lose that special property e.g. when the light is attenuated. Initially, we may consider only quantum noise, in a simplified picture described as the random phase of photons added by spontaneous emission. This leads to a “random walk” of the optical phase, which is related to a phase noise PSD Sφ(f) ∼ f−2. The divergence at f = 0 is related to the unbounded drift of the phase, which, unlike the output power, lacks a “restoring force”. It also causes a finite value of the linewidth, which is the width of the main peak in the power spectral density of the optical field. A famous paper from 1958 by Schawlow and Townes presented a simple formula to calculate that linewidth, and showed that the linewidth decreases for increasing intracavity power, decreasing resonator losses, and increasing resonator length. However, the quantum-limited linewidth is often difficult to reach, as other (technical) noise influences are dominating. In many cases, the linewidth, being a single value, is of primary interest for applications. However, the complete phase noise spectrum may be required in other cases, and may reveal important noise contributions even if these are not relevant for the linewidth. Essentially, the linewidth is determined by low-frequency noise. The measurement of phase noise or the linewidth is substantially more difficult than that of intensity noise, partly because the phase evolution must be compared with some reference. A conceptually simple but often impractical method is based on measuring a beat note of the laser with a second laser, exhibiting a similar optical frequency (keeping the beat frequency low enough) and much lower phase noise. Alternatively, two similar lasers may be used, and the relative phase noise provides an estimate for the noise of a single laser. Figure 2: Setup for delayed self-heterodyne measurements. The mirrors next to the acousto-optic modulator (AOM) have a reflectivity of e.g. 50%. The detector records the beat note between the frequency-shifted part and the delayed part of the laser light. This contains information on phase noise and linewidth. An often convenient variant is the delayed self-heterodyne method, using a setup as shown in Fig. 2. Here, one shifts the optical frequency with an acousto-optic modulator and derives a reference from the laser itself by introducing a substantial time delay with a long optical fiber. For a very long delay (which is often inconvenient to provide, however), the noise of the delayed reference would be uncorrelated to the laser noise, allowing a simple analysis. Noise measurements are still possible with shorter delays, but require a more sophisticated mathematical analysis. This should also take into account the possibility that the phase noise PSD does not exhibit an f−2 law. In principle, the phase noise spectrum can also be obtained from the optical spectrum, as recorded e.g. with a scanning high-finesse Fabry-Pérot interferometer. Here, the optical resonator provides a phase reference. This can work for a semiconductor laser, whereas it is hard to get the resonator linewidth below that of a typical solid-state laser. Lasers exhibit intensity and phase noise resulting from various internal and external influences, the impact of which is strongly influenced by the internal dynamics. Noise can be minimized in various ways; the best way strongly depends on the circumstances. Intensity noise is in principle easy to measure, but proper specifications need a decent understanding also of certain mathematical aspects, in particular of the influence of measurement time and bandwidth, and of power spectral densities. Phase noise measurements are subject to additional difficulties, partly related to the need for some phase reference and the mathematical complication of a diverging phase noise PSD. The laser linewidth is directly related to phase noise, but of course contains much less information than the whole phase noise spectrum. Quantum noise alone in a laser leads to the Schawlow–Townes linewidth, which however is often not reached due to additional noise influences.